The Homestake chairlift, from Silver Lake Village to Bald Eagle Mountain, will be replaced with a new detachable high-speed quad chairlift, halving ride time and increasing uphill skier capacity. Upgrades to the resort day lodges / restaurants, as well as the grooming fleet and the resort's recycling capacities are taking place for 18/19. Deer Valley Resort also has the pleasure of hosting the FIS World Championships from the 1st to the 10th of February 2019, showcasing the mogul and aerial competitions, a real spectacle if you catch it! Vail Resorts, whose multiple ski destinations includes Vail, Breckenridge, Beaver Creek and Park City, are launching EMMA, the Epic Mountain Assistant for its guests. EMMA is a digital ski assistant who can answer a range of questions about your ski holiday via text message in real time, using artificial intelligence & natural language processing. Ask EMMA whether your favourite slopes have been groomed today or about the best apres ski locations, snow fall & finding your way around the mountain, 24/7! The Canyons side of Park City is now even more family friendly, with upgrades to & an expansion of its learning area, the High Meadow Family Fun Zone. The old High Meadow fixed grip lift is being replaced with a new high-speed quad lift, at the top of the Red Pine Gondola, to help create a mountain top area well suited for beginners. The new "Candy Cabin" is sure to be a hit with the kids, when a snack is needed! The mountain restaurants are getting an upgrade too, with the mid-mountain lodge having an interior renovation and the Cloud Dine restaurant expanding to accommodate 200 additional seats. An important date for the diary in Park City is the Sundance festival which will run this season from the 24rd of January to the 3th of Feburary, a week later than last year. This huge event showcases the best in film and the movies win awards year after year. The mountain is quiet during this event, so guests can enjoy movies & skiing on the empty slopes! Snowmass's second phase of its base area is being developed for the 2018 / 2019 season. 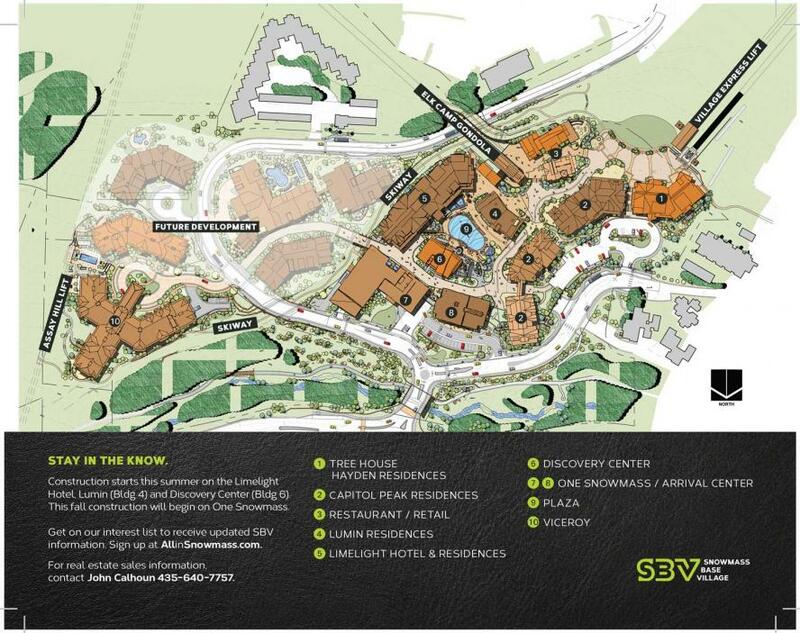 Additions include a brand new Limelight hotel with 100 rooms & larger residences. In this complex there will be an on-site restaurant with an exciting après-ski scene, five story climbing wall, fitness centre and hot tubs. There will also be a central public plaza space with fire pits and an ice rink in winter, plus a new Four Mountain Sports, Aspen Snowmass' own ski / snowboard gear and rental shop. Click above to enlarge Snowmass base area map. Aspen ski mountains turn 60! Aspen Highlands and Buttermilk mountains are having their 60th birthdays this season, celebrating with a special promotion. The offer includes lift tickets for late and early season at only $60/day! Vail is the first mountain resort in the world to achieve certification as a "sustainable destination". This means that they have been commended for their cultural heritage conservation, solid waste reduction, accessibility and landscape and scenery. Jackson Hole is making strides to become more family friendly and cater to more beginner & intermediate skiers, as well as letting experts take advantage of its more extreme terrain. Jackson Hole Mountain Resort's Solitude Station will open in 18/19 and provide a true beginner area, mid mountain, with 12,000 square feet of Mountain Sports School, rental and dining facilities, accessed by the Sweetwater gondola. intermediate skiers can also take the gondola up to access the wonderful Casper intermediate area of the mountain. What exciting new developments in the American ski resorts for the 2018 / 2019 ski season, we hope you get to experience some of them! Ask Chalets USA about your USA ski holiday today! We live in the USA, know the ski resorts & accommodation and visit them regularly. We can give you expert advice and save you time & effort finding the right USA ski holiday for you.